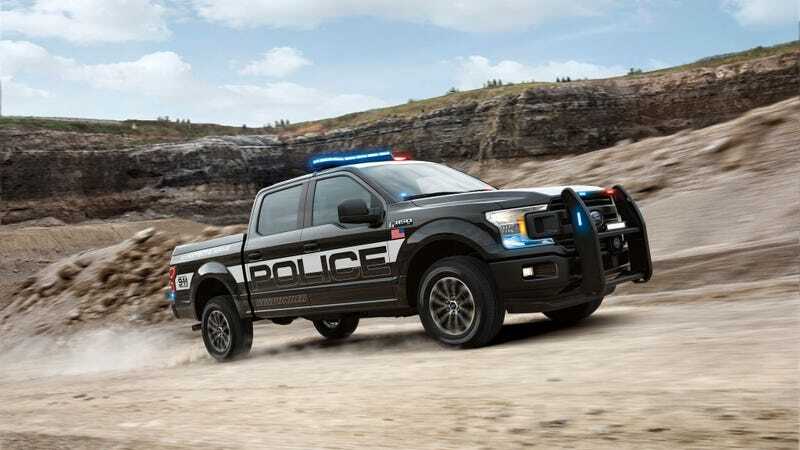 Ford has been extremely rude lately developing a new generation of police pursuit vehicles, and now it’s introduced the F-150 Police Responder. It’s getting really hard to keep track of everything I’m supposed to spot from a mile down the road. Based on the civilian F-150 FX4 with a SuperCrew body, the new, very Robocop sounding POLICE RESPONDER pickup is the most spacious police car on the inside, with a covered bed for additional storage. It has the 3.5 liter EcoBoost V6 good for a criminal-crushing 375 horsepower and 470 lb-ft of torque with a 10-speed automatic transmission controlled with a column-mounted shifter, baby. It’s also the most geographically capable cruiser, equipped with four-wheel drive to make it more difficult for those incredibly entertaining police chases that jump from the highway through some cattle pasture and go on for 45 minutes longer than anyone should be comfortable with. The truck is equipped with an upgraded 240-amp alternator for those pretty lights, upgraded brakes, underbody skid plates, a special police-rated speedometer (whatever that means) and is capable of towing up to 7,000 pounds. The truck is intended for police services that patrol beyond the typical street environment, and Ford claims it’s the first pursuit-rated police truck. We’ve reached to clarify what, exactly, it takes to be pursuit-rated and will update when we hear.